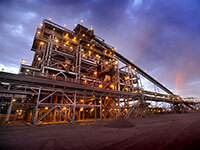 Khumani Iron Ore Mine replaces the older Beeshoek Iron Ore Mine as the main iron ore producer for Assmang. Although originally designed to produce 10 million tons of export quality iron ore each year, it now has the capacity to produce 14 million tons of product after the completion of phase 2 of the Khumani Expansion Project. 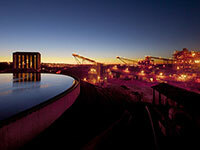 The iron ore mined at Khumani Iron Ore Mine is exported via the Saldanha Bay Iron Ore Bulk Terminal. Civil construction began on 05 October 2006, by which time the majority portion of the earthworks was completed. Steel and platework fabrication commenced the following day. Mechanical construction at the Parson processing plant commenced on 09 March 2007, quickly followed by piping, fabrication and erection in May that same year. The month of May proved to be critical in the ever-evolving history of Khumani as the very first blast took place during this month, which dislodged approximately 600,000 tons of ore for collection and treatment. The mine infrastructure packages progressed well and by October 2007, parts of the plant were ready for cold commissioning. Hot commissioning, the last major primary testing phase, began at the end of 2007. The first consignment of ore was delivered to the Bruce primary crusher in December 2007. Both the on- and off-grade screening plants were ready to treat ore by late 2007, while construction of the jigs and High Pressure Grinding Roll (HPGR) sections were still in progress. 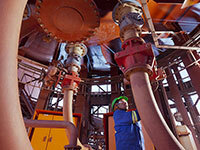 The jig plants were the last element to be finalized with commissioning taking place in July 2008. Assmang was able to bring Khumani to the development and ramp up stage by the early months of 2008. The initial ramp up phase came to an end in 2009 and on 12 April 2009 the company announced that the mine had reached its full production capacity of 10 million tons per annum. Assmang was obliged, as per agreement with Transnet, to put 6 million tons of iron ore on the export line during the 2007/2008 fiscal year. With the processing plant unfinished at Khumani at that time, more than a million tons of Run of Mine (ROM) ore had to be transported by road to Beeshoek for processing. The other 5 million tons came from Beeshoek itself. The first train, destined for Saldanha Bay, was loaded at the Khumani Mine in May 2008. The iron ore is mined from a series of open pits on the Bruce and King properties by means of conventional drilling, blasting and loading onto trucks, followed by hauling to either of the Bruce and King primary and secondary crushing facilities. From there, it is transferred by means of overland conveyors and stockpiled onto blending beds that divide the material into two categories, on- and off-grade material, before reaching the Parsons Beneficiation Plant. On-Grade material is moved from the on-grade stockpile through to the Washing and Screening Plant situated on the Parsons property, to ultimately produce final product incorporating tertiary crushing of any oversize material from the screening plant. Off-grade material is moved from the off-grade stockpile through to the Washing and Screening Plant. Any oversized material is crushed in the Tertiary Crushers, and also beneficiated through jigging in the Lumpy or Fines Jig Plants, in order to remove any contaminants. The final products are stockpiled on the Lumpy or Fines product stockpiles, before loading through a rapid load-out station onto 342 wagon trains (a total of approximately 34,200t) that are sent for export via the Port of Saldanha Bay on South Africa’s West Coast, via the 861 km Sishen-Saldanha railway line (OREX Line).